USAF Captain Sean G. Keyes will be representing the United States Air Force at the upcoming Thunder of Niagara International Air Show at the Niagara Falls Air Reserve Station in Niagara Falls, New York, June 9-10. Admission to the air show is free and will feature live demonstrations by the USAF Thunderbirds. Captain Keyes, a HF-L 2007 graduate and BSA Troop 10 Eagle Scout, will be displaying and answering questions on the T-6 Texan turboprop pilot training airplane. 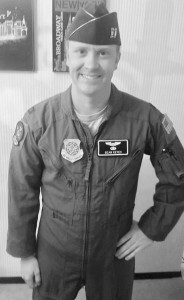 He is a T-6 Instructor Pilot and has been based at Columbus Air Force Base, Columbus, Mississippi for the past year. Prior to his current role, Keyes piloted and served as Commander of USAF C-17 cargo and troop transport planes based out of Joint-Base Lewis McChord in Tacoma, Washington. He has flown missions to Iraq, Afghanistan, Germany, Africa, South America, and Asia. After graduation from HF-L, Keyes attended Michigan Technological University (Michigan Tech) on an AFROTC scholarship and in 2012 received a B.S. in Mechanical Engineering. Sean is the son of Sheila and Gregory Keyes of Honeoye Falls. For more information on the air show, visit thunderofniagara.com.